It's a whole new slant on precision actuation. Part of a single-source package of valves, actuators, and controls, the new ActraCAM actuator matches torque output with valve requirements. A major chemical complex outside Houston used the VALVSERV Edge to save 6 days of downtime equivalent to $3,000,000 net. Do you have the Edge! 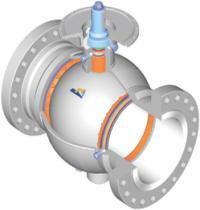 Can you visualize high integrity ball valves, cycling every seven seconds, and lasting for over 2,000,000 cycles without failure? The WKM 370 product line in this story proves: The Edge is Yours.